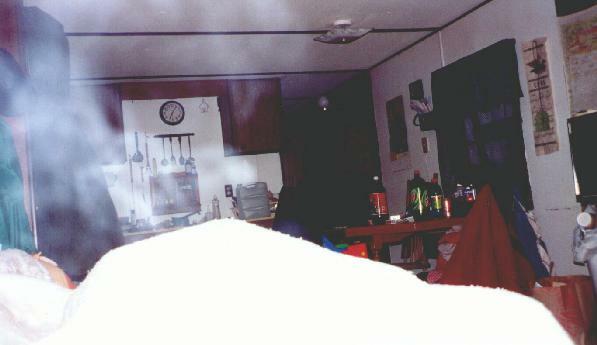 When my friend Jessie first moved into her boyfriend's trailer, she had trouble sleeping and was kept awake at night by noises. This sort of thing is common when you spend the night in any new place. However, over the next few weeks she noticed a pattern to the creaks and thuds. Every night between the hours of 2 and 5am, someone(thing?) was walking up and down the hallway and into the kitchen. After telling us about the noises, and her suspicions that the place was haunted, Laura, Gary, and I stayed the night over there to see, and hear for ourselves. We settled ourselves in the living room and waited. Sure enough, the footsteps came, down the hall into the kitchen, and stopped at the edge of the carpet where thew kitchen and livingroom connect. Amazed and excited, the 4 of us camped out in the livingroom for several nights over the next week. Once, we attempted to contact the spirit by means of an Ouija Board. For the full story on this incident, click here. 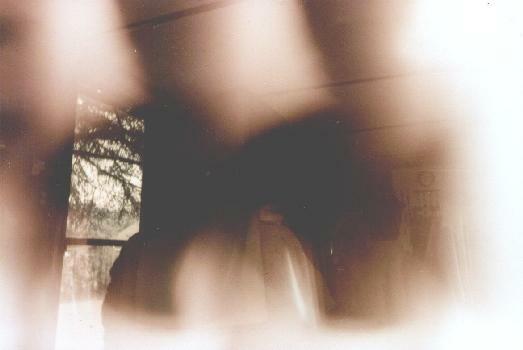 And after throughly freaking ourselves out, we decided to try photographing the spirit. We settled in for a long night with several movies and kept an ear peeled for the notorious footsteps...Not a sound the entire evening. After the end of the last movie, I was the only one still awake, and I knew I wasnt going to be able to fall asleep so I just lay there and listened. At aproximately 7am, I heard the footsteps. 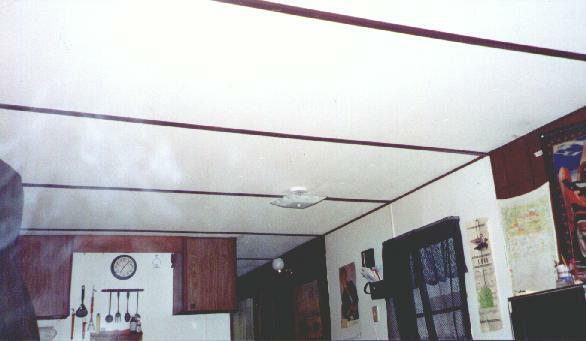 Once they entered the kitchen, the entire room temperature dropped at least 15-20 degrees. I tried to wake Jessie, to no avail, so I grabbed my camera and started shooting. The photos are large and may take a while to load, but PLEASE be patient, it's worth the wait! Check out this swirling mist! Please remember no one was smoking - they weren't even awake! It wasn't visable when I took the pictures. Looks like maybe it's trying to take shape. The mist is out in the kitchen, too. It's a little hard to see, the the mist looks like it might be taking the shape of a face?? The mist swirls over the head of Gary while he sleeps unknowingly! 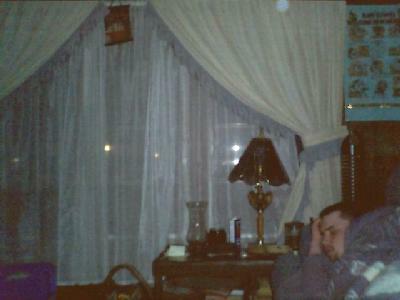 Here is an orb in the top right corner. This pic was taken on a different night. 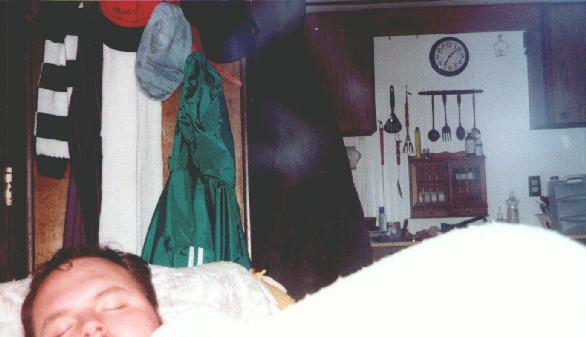 This photo was taken more recently by Jessie's 3 yearold son. 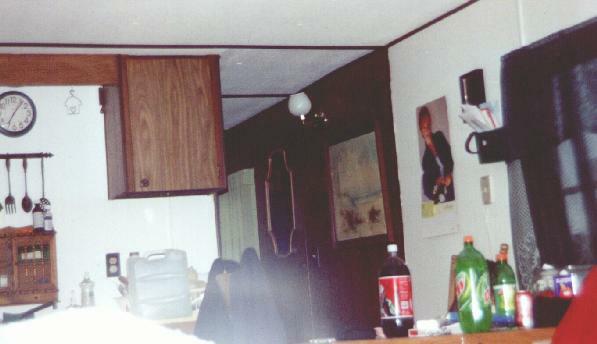 The pic is supposed to be of Jessie and Doug standing in the kitchen, however, a strange disturbance casts 2 shadows in the shape of people! At first I thought this was a case of double exposure, however, there is no other instance like it on the film negative. The first 5 pics were taken by Chris H.